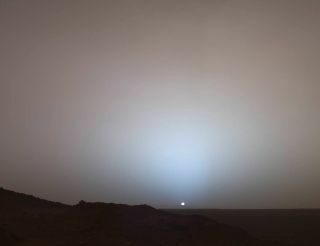 The Mars Rover Spirit took this sublime view of a sunset over the rim of Gusev Crater, about 50 miles (80 kilometers) away. Taken from Husband Hill, it looks much like a sunset on Earth — a reminder that other worlds can seem eerily familiar. Sunset and twilight images help scientists to determine how high into the atmosphere the Martian dust extends and to look for dust or ice clouds. A new museum exhibit highlights the accomplishments of two venerable NASA Mars rovers, just in time for the 10-year anniversary of the robots' arrival on the Red Planet. "Spirit and Opportunity: 10 Years Roving Across Mars" opened Thursday (Jan. 9) at the Smithsonian Institution's National Air and Space Museum in Washington, D.C. The exhibition features photos taken by Spirit and Opportunity, which landed on opposite sides of the Red Planet in January 2004 to search for signs of past water activity. The golf-cart-size Spirit touched down on the night of Jan. 3, 2004 (Jan. 4 GMT), followed three weeks later by its twin, Opportunity. The six-wheeled robots were originally supposed to explore Mars for 90 days, but they kept rolling far beyond their warranties. After getting bogged down in soft sand, Spirit stopped communicating with Earth in 2010 and was declared dead a year later. Opportunity, however, is still going strong, studying rocky formations along the rim of Mars' 14-mile-wide (22 kilometers) Endeavour Crater. The science returns from both rovers have been impressive. Spirit, for example, found evidence of an ancient hydrothermal system in 2007, showing that at least some parts of Mars once had two crucial ingredients necessary for life as we know it — liquid water and an energy source. Opportunity, for its part, has discovered clay minerals along Endeavour's rim, showing that neutral (rather than acidic) water was once present there. Such an environment may have been able to support microbial Martian life, if it ever existed, mission scientists have said. These loose, BB-sized, hematite-rich spherules are embedded in this Martian rock like blueberries in a muffin and released over time by erosion. The Mars Rover Opportunity found this cluster of them at its Eagle Crater landing site and analyzed their composition with its spectrometers. Hypotheses about their formation have contributed to the story of water on Mars. "Spirit and Opportunity: 10 Years Roving Across Mars" aims to bring art and science together in an immersive multimedia experience, museum officials said. "The centerpiece of the exhibit is a panoramic photo blow-up, wrapping two entire walls that surround a case holding a full-scale model of a rover. The effect is to give the visitor a sense of being on Mars," museum officials wrote in a statement. "The exhibition includes several pieces of equipment, including a wheel used in testing rovers on Earth," they added. "It features three videos: an animation of a rover descending and landing, and two compilations of images shot on the planet, one by Spirit, the other by Opportunity." Spirit drove a total of 4.8 miles (7.7 kilometers) on the Red Planet during its operational life, while Opportunity has covered 24.07 miles (38.73 km) so far.